Eurostat has recently published statistics on the financial assets of each European country (2011) and the fact that Belgium ranks first for financial assets per person (deposits and securities) was largely covered by the Belgian media. According to the articles, the net financial assets amount to 770 billion euros, which is 67.000 euro per person if you deduct the debts from the total financial assets of Belgium. For the major European countries, the net financial assets per person amount to 53.000 euros in Britain, 41.000 euros in France and 39.000 euros in Germany, so the wealth of Belgium does indeed stand out. (By the way, according to statistics from the Central Bank of Japan, the Japanese financial assets per capita are about 9 million yen (approximately 75.000 euros), which is more than Belgium). Moreover, Belgians own also a slightly larger amount in real estate per person. As for the reasons for this wealth, we can mention, in addition to a strong macroeconomic situation, a low property tax and relatively low real estate prices. At the same time, it has been pointed out that people are concerned about their old age because the pension and social security system is not as extensive compared to other European countries, which also increases deposits. By the way, a French newspaper used the expression “bas de laine” for a person’s financial assets. This expression comes from the fact that farmers used to hide their money in a sock in the past. It means a “hesokuri” in Japanese. I think it’s interesting that when learning languages, one also learns about the life style and customs of the people who speak that language. In Belgium, there is a traditional friendship association called Belgium-Japan Association (BJA) to promote friendship and cooperation between Japan and Belgium. Founded in 1963, the BJA celebrates this year its 50 years anniversary. The current president is Mr. Thomas Leysen who is the chairman of Umicore, one of Belgium’s leading companies. 600 companies and individuals from both Belgium and Japan are BJA members. The New Year Reception was held on 28th of January. By the way, looking back to the historical relationship between Japan and Belgium, a “Belgium-Japan Study Group” was established in 1906 and was mainly active in the development of industry and trade relations. This study group was forced to stop its activities due to the outbreak of World War I, but it was reestablished in 1922 and renamed the “Belgo-Japan Association”. The activities expanded as well and they were even involved in relief activities for Japan after the Great Kanto Earthquake and dispatched industrial delegations. However, this association also gradually lost its active place during the chaotic situation before World War II. Although there is no direct link between this prewar study group and association and the current BJA, we can trace the important role of private friendship associations in the history of the relations between Japan and Belgium over nearly 150 years. The Japanese School of Brussels is a full-time school from the 1st grade of elementary school to the 3rd grade of junior high school with 295 pupils. The Japanese Saturday School is housed there as well and is attended by 205 pupils. The peak year being 2008 with 399 pupils, the number has decreased considerably. The Japanese school of Brussels was established 34 years ago in 1979. In those days, Nihonjinkai was mainly operating the school and they constructed the school buildings (and later extensions) by gathering a capital of nearly 1.8 billion yen from corporate donations. The Japanese government has also subsidized about one third of the total capital according to the Sydney method (which means that the Japanese government subsidizes every year a certain amount that is determined by dividing the total amount of capital and interest on, for example, construction capital that the school management borrowed from financial institutions, over the term of repayment. This calculation method was adopted for the first time in 1971 for the construction of the Japanese School in Sydney, hence the name). The funding necessary for a school extension in 2010 will have also been completed in three years. The Japanese school of Brussels has a spacious campus and is located in a residential area in the east of the city. Being close to the subway station as well, it is convenient for commuting to school. I think that the school facilities are splendid. Late last month, there were several events in the Japanese school of Brussels and I was also invited as one of the guests. The graduation ceremony for junior high school students called “Yosenkai” was held on the 11th of January and on the 19th of January a “pounding mochi” event was held at the Japanese Saturday school of Brussels. Three days later, I held a welcome and farewell party for the teachers of the Japanese School. Lastly, I visited the International School of Brussels on the 25th of January and observed the study scene of the Japanese students. About 1500 students attend this school of which 95 are Japanese (fifth in order of nationality; most of them are students from the 3rd year of junior high school to the 3rd year of high school). Though there are other international schools in Brussels which teach in English such as the British School (1200 students) and St. John's International School (900 students), they all have a very high tuition fee in common. Most of the Japanese children attending the Japanese Saturday school of Brussels go to these international schools or local schools, and nearly half of them today are half-Japanese. It might be a proof that international marriages are increasing. The Belgian Federal Parliament consists of the Senate and the House of Representatives. All 150 members of the House of Representatives are directly elected. There are 71 senators (and 3 members of the royal family), but the method of selecting the senators is truly Belgian and very interesting. Only 40 senators are directly elected of which 25 senators for the Flemish region (Dutch-speaking region) and 15 for Wallonia (French-speaking region). Of the remaining 31, 21 senators are nominated by the Community Councils. The Flemish and French Community Council each designate 10 of their current members as senator and the German Community Council designates 1 senator. The last 10 senators are 6 Dutch-speaking and 4 French-speaking senators, assigned by the recommendation of both regions’ senators. It is indeed a complex procedure. The elections for the Senate and the House of Representatives are held at the same time and for both the term of office is 4 years. The powers of both Houses are clearly divided. The budget is subject to the House of Representatives and the decisions of the House of Representatives take priority over the Senate’s in passing the bills. After the reform of 1995, the Senate is positioned as the “House of Common Sense” and is entrusted with the task of expressing its views on major political issues and making recommendations. Therefore, there is no political chaos due to a “twisted parliament controlled by different parties” as is the case in Japan. Last week, I had the opportunity to meet individually with two senators. The first one was the Chairman of the Senate Sabine DE BETHUNE, a very energetic lady in her fifties. During a one-hour talk, we were able to exchange opinions ranging from the interaction between Japanese and Belgian members of Parliament to religious issues. Two days later, I had dinner with Senator Jacques BROTCHI and his wife. He is Jewish and a world-renowned neurologist. Even today he is seriously tackling the Holocaust issue, which led to the adoption of relevant resolutions at the Senate. I thought that these two senators are true representatives of common sense at the “House of Common Sense”. About two weeks ago, I visited Umicore which is a major company in charge of non-ferrous metals in Hoboken, the southernmost suburb of Antwerp. It took about one hour from Brussels by car. Mr. Thomas Leysen, previously mentioned in the BJA, is the Chairman of Umicore. Although he usually works at the headquarters in Brussels, he came all the way to Hoboken to welcome me at the precious metal recycling plant. The plant’s site is huge and covers more than 100 ha. There might have been almost 30 buildings with a big chimney. Umicore’s main business is dissolving at ultra-high temperature batteries and electronic circuit boards from used PC’s and mobile phones in order to extract metals such as gold, silver and copper and rare metals by using the difference in specific gravity. Waste gathered from all over the world was piled up and called the “Industry mine”. I was explained that Umicore’s predecessor company started mining operations in Congo (a Belgian colony in those days) more than 100 years ago. However, an “Industry mine” is more efficient and less costly than actual mining. Umicore has a plant in Japan as well, which supplies rare metals necessary for manufacturing catalysts for automotive engines and batteries for computers. By the way, when I was observing the last step in the process, I was allowed to touch a lump of gold (12.5 kg) and silver (24 kg) that had been extracted. With a purity rate of more than 99.9%, it was very heavy to lift up. These go straight into the bank vault. It was a once-in-a-lifetime experience. 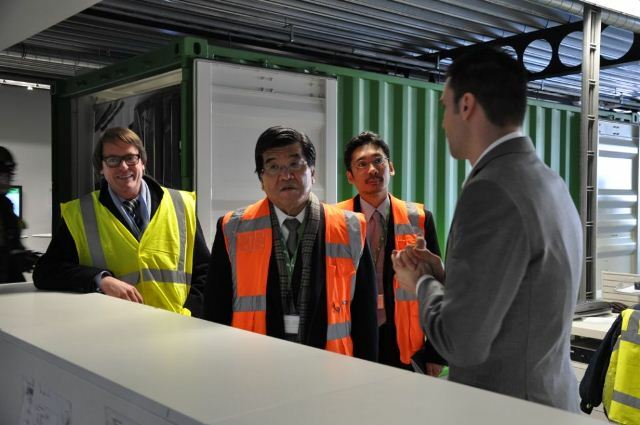 Last week, I visited AW Europe which is one of the few Japanese companies operating in Wallonia (AW Europe is the European management company of Aisin AW which is the joint venture of Aisin Seiki and Borg Warner). The manufacturing plant is located on the outskirts of Mons (population: 91.700), 67 km to the southwest of Brussels. Since 1996, AW Europe sells and repairs automatic transmissions for cars and manufactures and sells navigation systems. Moreover, AW Europe constructed a new large storage warehouse last year and the number of employees increased to 650. Also, there are nearly 300 employees in the headquarters (sales and management department) and AW Technical Center for research and evaluation in Braine-l’Alleud (33 km south of Brussels, population: 38.000). Together with departments in neighboring countries, more than 1000 employees work at AW Europe. (By the way, the headquarters of Aisin Seiki are located in Kariya city in Aichi prefecture. Despite being established less than 50 years ago, it has grown into a large company with more than 80.000 employees in total and sales of 2.3 trillion yen on a consolidated basis. A subsidiary company, Aisin Europe, was found in 1971 in Belgium). Contrary to the Flemish region (Dutch-speaking area) close to the sea, the number of Japanese companies operating in inland Wallonia is limited, but being close to the border of Germany and France and having a canal leading to the port of Rotterdam in the Netherlands, the location seems not bad as long as the sales market are the neighboring countries.